1999. The cold pit with earthen sides is in part sunk in the earth, and in part raised above it by walls of loam or turf. On these walls, glass frames are sometimes placed; and at other times, only mats or canvas frames. Such pits are used by nurserymen and market-gardeners, and answer perfectly for the preservation of half-hardy plants. 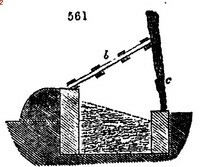 A pit of this kind, used at Valleyfield (fig. 561. ), is a sunk walled excavation, 3.5 ft. wide, 3 ft. deep at the back, and 1 ft. 9 in. in front. It is covered with thatched movable frames, which are tilted at pleasure by a notched prop. It is used as a kind of store-place for all culinary vegetables in leaf which are liable to be destroyed by frost, such as cauliflower, broccoli, lettuce, endive, &c. These, before the winter sets in, are taken up from the open ground, with balls of earth, and embedded on a bottom layer of rich soil, filling up the vacancies between and among the stems with old bark or decayed leaves. Air is given, on all occasions, when it can be done with safety; and, in severe frosts, additional coverings of litter are put on.